"SSBU" redirects here. For the Wii U version of Super Smash Bros. 4, see Super Smash Bros. for Wii U.
Super Smash Bros. Ultimate (大乱闘スマッシュブラザーズ SPECIAL, Great Fray Smash Brothers Special) is a fighting game for the Nintendo Switch. It was first teased on March 8th, 2018 at the end of the Nintendo Direct released the same day, and fully revealed on June 12th at E3 2018. It is the fifth installment in the Super Smash Bros. series (sixth if both versions of Super Smash Bros. 4 are counted as two games). The game was released worldwide on December 7th, 2018. Ultimate has received universal acclaim, with several critics calling it the best installment in the series. They praised its large amount of content and fine-tuning of existing Smash gameplay elements, although its online mode received criticism. It was estimated that the game sold over 5 million copies worldwide within three days of release, making it the fastest selling Switch game. The game has sold 12.08 million units as of December 31st, 2018, marking it as the fastest selling Nintendo game in history. The opening movie of Super Smash Bros. Ultimate is composed of the cutscenes from World of Light and gameplay footage from the game set to the tune of Lifelight, featuring all the characters in the game barring DLC. Panoramic Artwork of all playable fighters as of April 16th, 2019. All 63 characters (65 if counting the Pokémon Trainer as three fighters) from all previous Smash Bros. games return as playable characters. As well as the returning cast, the game also features 11 newcomers in the base game, with at least six characters (two known and four unknown) planned as downloadable content. In total, this ensures that at least 74 characters (76 if counting the Pokémon Trainer's Pokémon) are playable in the game at launch and 80 (82) characters are playable overall, the most for any Smash Bros. game. Each character is numbered in the order from when they first joined the series, with the exception of echo fighters (who share a number with the character they are based on) and Pokémon Trainer (whose Pokémon are numbered instead). The character selection screen in Super Smash Bros. Ultimate with all of the characters unlocked and all current downloadable characters available. Inkling, with various Girl and Boy designs from the original Splatoon, was the first character confirmed to appear in the game as a new playable fighter. Ridley, a central villain from the Metroid series, was confirmed to be playable during E3 2018, with Meta Ridley as an alternate costume. Simon of the Castlevania series was announced as the game's first third-party newcomer. King K. Rool, arch-enemy of Donkey Kong and Diddy Kong from the Donkey Kong series, was confirmed to be a playable newcomer as well, with his move-set drawing on his appearances as a boss in the Donkey Kong Country games onward. Isabelle from the Animal Crossing series, who previously appeared in Smash 4 as an Assist Trophy, makes her playable debut as the second Animal Crossing representative. Finally, in the November Nintendo Direct, Incineroar from Pokémon Sun & Moon was announced as the title's last base roster newcomer. In addition, most clones are now classified as "Echo Fighters" and are marked with an epsilon (ε) next to their fighter numbers, which they share with the character they are based on. Returning characters Lucina and Dark Pit have been given this title, while new characters Daisy, Richter, Chrom, Dark Samus, and Ken are Echo Fighters of Peach, Simon, Roy, Samus, and Ryu, respectively. Aside from an option allowing these characters to be displayed on the same slot as their counterpart on the character select screen exclusively during Vs. Mode, Tourney, Custom Smash Super Sudden Death, and Quickplay; there is no special distinction between them in game, and the name is used mostly for marketing purposes. Piranha Plant from the Mario series touches new ground as the first mob character in Smash, and as the game's first DLC character. It has been confirmed that five more unique newcomers will be added as DLC by February of 2020, with Persona's Joker being the first revealed DLC fighter of the five. The other four fighters are currently unknown. With the exception of Piranha Plant, all of the DLC characters can be bought together as part of the Fighter Pass. As was the case in Super Smash Bros. 4, a further fifteen "characters" exist as alternate costumes for other preexisting characters. Specifically, Alph as a palette swap of Olimar; each of the seven Koopalings as palette swaps of Bowser Jr.; and Pokémon Trainer, Villager, Wii Fit Trainer, Robin, Corrin, Inkling, and Pikachu, all have alternate genders that are separate individuals. Only the starting characters from the first game are available from the start. Like in Smash 4, the Mii Fighters are also available via customization. The rest of the characters must be unlocked, however the unlocking process and conditions are comparatively quick and easy than before: requiring players to simply play enough VS. matches, unlocking captured fighters in World of Light, or clear Classic Mode with the fighters. All Light Realm and Dark Realm bosses, except for Galeem and Dharkon, are also featured as Classic Mode bosses. With the exception of the Super Smash Bros.-original stages, all stages are ordered in chronological appearance and for the first time ever, all stages are available immediately from the start. Additionally, all stages can be played with up to 8 players, rather than just a select few as in SSB4. All stages have both a Battlefield form and Ω form. Ultimate currently features 103 stages (305 if including Battlefield forms and Ω forms). An additional five planned stages will be added to the game via downloadable content, which will bring the number of stages up to 108 (320 if including Battlefield forms and Ω forms). In update 3.0, Ultimate gained the option to create custom stages with the Stage Builder. Currently, only 15 stages featured in previous games are not available in Ultimate (not including either single player-only stages and previous forms of Battlefield and Final Destination). The list can be seen here. For the entire list of items, see Items page. Rage Blaster Shooting Does more damage the higher the user's damage is. Super Smash Bros. Towards the end of Super Smash Bros. 4's post-launch development, Masahiro Sakurai announced that his next project had been decided and that he would be taking a small vacation following the end of development. Unlike previous Smash titles, which had their development studios built from the ground up, Bandai Namco returned to help game development. Prior to starting development, the team had a choice between completely overhauling the game's system and feel or working off of what was established in the last game. The team ultimately went with the latter. Had the team gone with the former, the game would have likely only had a third of its characters. Despite deciding to base the game off of the previous installment, Sakurai still increased the overall speed of the game, but only by an amount that wouldn't be too alienating to people unfamiliar with the series. Sakurai notes that he had wanted to make these changes in previous titles, but was unable to because it was easy for one to lose track of their character's position on screen, especially on the Nintendo 3DS. When Sakurai had revealed to his development team that he intended to bring back every previously playable character, he was met with silence. The project plan was later finished by December 2015, and development officially began in February 2016, immediately after DLC wrapped up for SSB4. On November 12, 2017, Nintendo filed a number of trademarks, notably including a Japanese Super Smash Bros. logo. A Super Smash Bros. title for the Switch was later officially revealed on March 8, 2018 via a Nintendo Direct. Without explicitly confirming the playable status of any characters, the teaser trailer hinted the Inklings would be debuting in the game as newcomers, while also suggesting that Mario, Link, and several other series veterans would be returning. Shortly after the reveal, Sakurai confirmed in a tweet that he had been working on the game "in silence, day after day". On March 22, 2018, Nintendo announced the Super Smash Bros. Invitational 2018, a tournament taking place on June 12th where invited professional players will play the upcoming game. Later, in volume 542 of his Famitsu article, Sakurai revealed that his work schedule had been cut down significantly, citing strict regulations regarding work hours. On April 18, 2018, Nintendo again filed a number of trademarks for several game logos, including the Super Smash Bros. logo. Most of these game logos originate from games with some relationship to the Smash series, including Pikmin, Star Fox, and F-Zero. These trademarks were approved on May 14, 2018. The first extended look at the game came at Nintendo's E3 2018 presentation. Masahiro Sakurai introduced the coverage, which kicked off with an extended video showing new incarnations for veteran characters. After confirming the return of previously cut characters such as Ice Climbers and Snake, the tagline "Everyone Is Here" was introduced, and the video revealed that all playable characters from previous Smash Bros. titles would be returning to the new game, including the formerly cut Ice Climbers, Pichu, and Young Link from Melee, as well as Pokémon Trainer, Wolf, and Snake from Brawl. New information on the Ultimate incarnations of characters was revealed, including the presence of Cappy in Mario's taunts and other moves, that Zelda would be based on her Link to the Past design, all the DLC fighters from Smash 4 would return as part of the launch roster, Ike would have his Path of Radiance and Radiant Dawn designs from the two previous games and much more. The presentation introduced "Echo Fighters", which Lucina and Dark Pit are now marked as, while Daisy was revealed as a new Echo Fighter. The presentation also confirmed returning elements, items, and stages, which would receive revamped Ω forms and Battlefield forms. The trailer also confirmed the Inklings as the game's first newcomers, while concluding with a reveal of the game's final title: Super Smash Bros. Ultimate. The presentation officially concluded with a final trailer in which Ridley from the Metroid series - long requested by fans for inclusion in the series but rebuffed by Sakurai due to his large size - was confirmed as a playable character. Following the end of the presentation, a Nintendo Treehouse event went live. During the Treehouse event, several matches were streamed and some new features were revealed and discussed. In addition to the Treehouse livestream, a playable demo of the game was opened to the public at E3 2018 and at the Nintendo Store in New York. Following the end of the Splatoon 2 World Championships, the Super Smash Bros. Invitational 2018 began. During the match pitting MkLeo as Bayonetta against Plup as Ridley, Masahiro Sakurai reportedly shook his head after MkLeo had performed a successful ladder combo on Plup. At the end of the invitational, the Nintendo Treehouse livestream resumed, further showcasing more gameplay elements and matches. In addition to this, the official Super Smash Bros. Ultimate website was published. This would serve as the primary source for new details about the game. At the EVO 2018 fighting game tournament, Nintendo revealed that a new Ultimate-focused Nintendo Direct presentation would be released on August 8, 2018. The presentation opened with a trailer confirming the inclusion of content from Konami's Castlevania franchise for the first time in the series. The trailer revealed the presence of new fighters, Simon Belmont and his Echo Fighter, Richter Belmont; a new Assist Trophy, Alucard; a new stage called Dracula's Castle, and more. The Direct also covered two new Echo Fighters, Chrom and Dark Samus, as well as new music, modes, stages, and items. The presentation concluded with a trailer introducing a new playable character: King K. Rool, leader of the Kremlings and nemesis of the Kong family from the Donkey Kong and Donkey Kong Country series. In a Nintendo Direct presentation shown on September 13, 2018, a Super Smash Bros. Ultimate Nintendo Switch console bundle was unveiled, featuring a specially designed dock and Joy-Con controllers along with the download code for the game. Isabelle, from the Animal Crossing series was also revealed as a newcomer. The final pre-release Ultimate-focused Nintendo Direct presentation aired on November 1, 2018. This revealed Ken and Incineroar as new playable characters, as well as the inclusion of DLC fighters - Piranha Plant appearing shortly after launch, followed by five other unannounced characters, which have been selected in advance by Nintendo as future additions, and have yet to be developed. It also took a deeper look at the game's modes and online infrastructure, and revealed Spirits mode and Adventure Mode: World of Light, before finishing with the mode's opening cutscene and the reveal of the game's vocal theme, Lifelight. 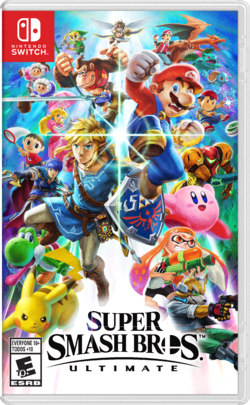 On November 20, 2018, an overview trailer narrated by Xander Mobus (The Announcer) covered the game in further detail, showcasing all of the playable fighters, stages, items, Pokémon, Assist Trophies, Spirits, modes and more. At the 2018 Game Awards, the Phantom Thieves from Persona 5 interrupted the broadcast to announce that their leader, codenamed "Joker," would be joining the roster as the first DLC fighter of the Fighters Pass in Ultimate. During the Nintendo Direct on February 13, 2019, a spring update was announced alongside a sneak peek at Joker's model and a look at new amiibo. In the "Nintendo Switch My Way" trailer, "Stage Builder" was announced for the "Games and More" section. In Vs. mode, the stage selection screen now appears before the character selection menu, making players select a stage before selecting characters. The rule selection screen appears before the stage selection screen. Players can now save rulesets for quick access. All stages now have a Battlefield form. Ω forms are also standardized to have the same underside shape akin to Final Destination, with none of them having vertical walls. Stage hazards can be turned off for the first time in the series, allowing players to remove intrusive elements, such as "environment changes or enemy appearances" from gameplay. The new Stage Morph option allows two stages to be selected at once; the two stages will transition into one another either at random or on specified time intervals. Alternate costumes are now shown at the bottom of the player's portrait, with at least eight small stock icons representing each palette swap. Additionally, each color is now listed with a name from the numbers 1-8 (e.g. Color 5). In timed matches, characters in the lead will occasionally flash with a gold sparkle. While a Smash Mode match is loading, an intense versus splash screen will appear, showing the combatants. Tips still appear regularly on loading screens in other modes, and can appear on the splash screen when loading takes long enough. The damage meter now displays tenths of a damage percentage (e.g. 10.5%). Note that while all games since Melee have used decimal percentages, this is the first game to reveal that fact instead of simply rounding down for display. In one-on-one stock fights, the stock count of both fighters will be briefly displayed onscreen whenever a stock is lost. The character select screen is now similar in appearance to the original Super Smash Bros. menu when starting the game, with the other fighters unlocked later on. 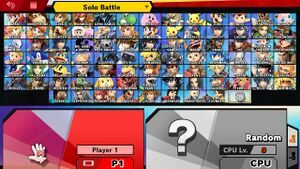 Instead of being roughly organized by series, the character select screen now organizes characters (with the exception of Echo Fighters and Mii Fighters) by when they were first officially announced for a Super Smash Bros. game. While a fighter is knocked off the stage, a minimap which shows the character locations, blast zone, and camera zoom will appear on the corner of the screen. The closer a fighter is to a blast zone, the smaller their "magnifying glass" camera becomes. It will start flashing when they are almost touching the blast line. Like Little Mac's Power Meter in Smash 4, several characters now sport additional UI elements next to their damage meter, such as Villager's Pocketed item, Robin's durability counters, or Inkling's Ink Tank gauge. Stages that once shared names now have been renamed. For example, the Smash 64 version of Yoshi's Island is now Super Happy Tree and the Brawl version of Mario Circuit is now Figure-8 Circuit. Tracks in My Music are now organized by series rather than by stage, such that all music from a given series will be available across the stages corresponding to that series. Additionally, many remixes from 64 and Melee have had their names updated to reflect the source music title, rather than the stage they were present on, such as "Poke Floats" becoming "Pokemon Red/Pokemon Blue Medley". Sound Test can be used to create music playlists, which can be played in handheld mode while the screen is off like a music player. Squad Strike has players battle with a squad of 3 or 5 fighters. Multiple formats of Squad Strike are available, including one where the entire team of fighters is used in a single continuous battle, similar to the final battle of Smash Tour in Super Smash Bros. for Wii U.
Echo Fighters can either be displayed in their own character slots, or share their slot with the character they are based on, depending on user preference. The main text font from Melee, Brawl and SSB4 is no longer used. The user can set up control settings for players who don't enter a name. To increase gameplay speed, all damage taken in one-on-one fights with no items is multiplied by 1.2×. Buffering has been strengthened, as actions can now be buffered by inputting them at any point during a previous action and holding the inputs until they are possible. The 10-frame buffer from Brawl and Smash 4 is still present in case the inputs are not held. Short hop aerial attacks now have a damage multiplier of 0.85×. This applies until the player lands or uses a midair jump. Buried opponents no longer take less knockback from attacks. The physics of launch movement have been overall sped up, with characters receiving knockback having a much higher initial speed and deceleration, resulting in being launched at higher speeds yet slowing down to nothing quickly. This does not affect moves with fixed knockback. If a character is struck with enough knockback by a meteor smash, they will be KO'd as soon as they are off-screen, rather than reaching the bottom blast line. This makes sacrificial KOs that rely on meteor smashes more reliable. Hitstun increases at a slower rate for knockback that causes tumbling, decreasing it at higher percents compared to Smash 4. However, this is compensated by characters being faster overall as described by the mobility changes below, still allowing for more combo opportunities below high percents. The base amount of freeze frames has been increased. However, there is an additional freeze frames multiplier that is lower the more players are participating in a match, with a maximum of 1× for two players (effectively standardizing freeze frames in one-on-one matches) and a minimum of 0.75× for eight players. Rage has had its knockback increase reduced to a maximum 10% boost, down from 15%. Additionally, it no longer applies to hits that use set knockback, preventing linking moves with high set knockback from KOing at disproportionately early percentages. Stale-move negation uses higher damage reduction values, with a fully stale move dealing 0.4695× of its original damage (down from 0.5294×). Additionally, moves now stale when hitting a shield. Shields deplete faster when held, now even surpassing Melee's shield depletion. When holding a special move button or multiple shield buttons while shielding, moving the control stick allows for shield angling without triggering rolls, sidesteps, or jumps (with tap jump on), making it easier to perform. Perfect shields are performed in reverse: instead of pressing the shield button a few frames before an attack connects, players have to release the shield button when an attack connects on their shield instead. The window for the technique is also larger, lasting 5 frames instead of 3. A successful perfect shield causes the screen to pause briefly, with the fighter's eyes flashing to signify a perfect shield, and no shield damage being taken as a result. This updated mechanic makes perfect shielding a riskier tactic, and less likely to be performed unintentionally, but allows fighters to retaliate much faster against attacks when successful. Shield dropping incurs 11 frames of lag, up from 7 in SSB4, making the game less defense-focused. However, the minimum time the shield must be held for before it can be dropped has been reduced from 11 frames to 3, assisting in the new perfect shield mechanic. Shield platform drops are no longer possible. Grabbing an edge consecutively without landing or getting hit now decreases the intangibility of subsequent edge options, to the point of granting no intangibility at all from the fourth edge grab onward. Additionally, in a similar vein to Aether in previous games, characters can only grab edges up to six times under these conditions. This further decreases the effectiveness of planking strategies. Edge sweet spots have become smaller, and recovery moves take longer to snap on ledges in general. This makes recovering more difficult. The window to tech has increased from 8 frames to 11 frames, and teching in general has mostly been restored to its state in Brawl (but the added leniency while already making contact with a wall or ceiling is retained), removing all of the untechable situations from Smash 4; however, sustaining too much knockback from a certain distance from a surface can prevent characters from teching, making stage spikes guaranteed at high enough percents. This threshold is indicated by the visual shockwave of a rebounding character turning red. The threshold is also much smaller for characters that hit the ground, making meteor smashes more effective on-stage on aerial opponents. Opponents footstooled in midair can now tech on the ground during the animation. However, footstools now also grant the user a few frames of intangibility upon leaping off the opponent. Meteor smash attacks can no longer be teched when grounded, regardless of their properties, making them more reliable for starting combos. Locks can only be performed twice in a row, and no longer force the target to perform a standing getup, removing their guaranteed setups into powerful moves such as charged smash attacks. However, they can still be used to combo into faster attacks before the target can get up from the lock. Characters that originally cannot swim or have a weakness to water in their home series now take slow, constant damage while swimming. The fighters affected include Charizard, Incineroar, Inkling and Sonic. If a character lands in deep water while using a move with high downwards velocity, they will keep most of their movement speed when diving. This now causes moves such as Stone, Aether, Bowser Bomb or Super Dedede Jump to become self-destructs at certain heights. Characters can no longer run through other characters and instead push them backwards, preventing cross-ups or mixups revolving around moving through an opponent. This also seems to affect several momentum-based moves, which now stop on shield (such as Fox Illusion and Heel Slide). However, there are still a handful of moves that are still capable of crossing up, such as Simon and Richter's dash attack. Screen KOs are much faster, making them once again faster than Star KOs. Waiting on a revival platform now gradually decreases the invincibility period of a character after they get off it, lasting only one second instead of two if they stay on it for the maximum duration. Shield breaking does not grant the victim any intangibility if it happens during the last five seconds of a match. Sudden Death consists of the screen slowly zooming in, making the blast zones gradually shrink. It also appears to have a fixed camera angle, and the screen progressively gets covered in aesthetic flames, starting with the corners. If the screen has finished zooming in, Bob-ombs will start falling after a while. The length of a Timed Battle can be adjusted in 30-second increments between one and three minutes. Stamina battles are now part of the basic rule selection, allowing for combinations such as stamina with stocks. The Final Smash Meter is a new Rules option that enables fighters to charge up their Final Smash over time for use without a Smash Ball. When this option is turned on, a gauge will appear under each fighter's damage display. The more damage the player deals or receives, the more the meter is filled. When it is filled, the player can use a weaker version of their Final Smash. The new Custom Balance menu allows assigning handicaps to individual characters. Intended for leveling the field between players of different skill levels, each character can be assigned a Custom Balance value between -3 and +3, with negative numbers reducing damage dealt, and positive numbers increasing damage dealt. These values are only applied when the Custom Balance rule option is enabled, which is not available in multi-console wireless or online play. In update 2.0.0, the ability to consistently perform a short hop by simultaneously pressing two jump buttons was added. The jumpsquat timing of every character has been standardized to 3 frames. Run speeds have been increased by about 10% for a majority of the cast, with some having larger increases, while walk speeds have had a similar 5% increase. Air speeds have been increased by about 5% for a majority of the cast, with some having larger increases. Traction has been significantly increased across the cast. The initial frames of full hops from the ground are sped up for all characters. Oddly, this can be bypassed by using a jump just before walking or running over the ledge. Landing lag for aerials has been reduced by 40% for most of the cast, and landing lag from helplessness has been significantly reduced overall. For some moves, the landing lag is even less than in Melee with L-canceling. Perfect pivoting can no longer be performed, as characters no longer enter their standing animation when turning around out of their initial dash. Rolling and spot dodging repeatedly now penalizes the user with increased lag and less intangibility frames, leaving them more vulnerable. Backward rolls have more ending lag overall, hindering their utility further for retreating safely, and making them practically different from forward rolls again. Spot dodges can be canceled earlier than usual (by 5 frames if fresh) into any grounded attack other than grabs and dash attacks, making them more effective for retaliation after dodging opposing attacks. Air dodges now contain elements from all previous incarnations of the technique: players can either perform a neutral air dodge by keeping the control stick in a neutral position (akin to a neutral aerial), which functions like Brawl and Smash 4's air dodges, or a directional air dodge by holding in a direction, which grants characters a quick momentum boost towards much like Melee's air dodges, but without making them helpless. Characters can only air dodge once before landing, grabbing an edge or getting hit, and both types of air dodges have much more ending lag, with directional ones lasting more than a full second. However, both have less landing lag than air dodges in Smash 4 (10 frames in the case of neutral air dodges, down from 21), and unlike air dodges in Melee, directional air dodges allow characters to grab edges during their ending lag. This significantly weakens defensive play by making air dodges more restricted and punishable, but increases their effectiveness for escaping juggles and recovering if used opportunely. Wavedashing has made a return from Melee, alongside techniques associated with it like wavelanding. However, it is significantly weaker due to the new mechanics added to directional air dodges, compounded further by their higher landing lag, as well as the cast's increased traction. Initial dashes have been lengthened, allowing some aspects of dash-dancing to return. They have also been significantly increased across the cast and have much less range in variance, with the slowest being slightly above Mario's in SSB4 and the highest being slightly above Fox's. As a result, some characters now have initial dash speeds that outpace their running speeds, allowing fox-trotting to alleviate their low mobility; examples include Ganondorf and Incineroar. Being sent into hitstun by any attack from behind will preserve the direction the character is facing, like with Back Slash in Smash 4, having the effect of preserving the positions of their forward and back aerials. As a result, all characters now have unique hitstun animations for taking hits from behind. Characters can now perform any ground attack out of a run, including their neutral attack, tilt attacks, and all smash attacks. In previous games, only dash attacks, up smashes and special moves could be performed out of a run. Characters can also instantly turn around to input any grounded attack in the other direction. Short hop aerial attacks can be performed by pressing the jump and attack buttons at the same time. However, this makes full hop aerial attacks more difficult to perform. As a further aid, several ground attacks can now be canceled by jumping during their very first startup frames (with a maximum of three for most), in which case they will automatically transition into a short hop aerial attack. The linking hits of all neutral attacks have had their angles and knockback altered to drag opponents close to the user, in addition to not lifting them off if they are on the ground. This allows for neutral attacks to connect much more reliably than before, and gives all of them the ability to jab lock (with the exception of Ganondorf, Meta Knight, Roy and Chrom). However, this removes guaranteed jab cancel setups. Neutral infinites have all been reduced in damage, but do far more hits in the same amount of time and inflict less freeze frames, making them harder to escape. Their pushback from hitting opponents can also no longer drop the user off edges. The function of the 0° launch angle has been changed, now raising to 30° at greater knockback values against grounded targets, similarly to the Sakurai angle, but occurring later than said angle. Down tilts can be reversed by holding the control stick diagonally down and back, allowing characters to quickly use them in the opposite direction without the need to stand up from crouching and turn around. Smash attacks can be delayed for two additional seconds after reaching full charge. This is indicated by characters freezing in the last frame of their charging animation until the smash attack is released. Up smashes and up specials can be used out of shield without jumping. Aerial attacks can be performed while hanging onto a ladder, a property known officially as a "ladder attack". Frame canceling has been removed. All variations of regular grabs have more ending lag, making them easier to punish if missed. Conversely, extended grabs have less ending lag, no longer leaving characters as vulnerable compared to regular grabs. If two grabs collide, both characters take minimal damage and act as if grab released. This event is known as "grab parrying" by the in-game tips, and removes the effect of port priority in determining who gets the grab. Shield grabs can no longer be used immediately after shieldstun from an attack ends, instead forcing the character to hold their shield for 4 extra frames beforehand. Pummels have been universally sped up, but deal less damage. Weight dependency for throws has been removed: all throws now execute at their usual speed against the entire cast, much like in SSB. Edge attacks have been buffed, dealing 9% damage on average (up from 7%), and now granting intangibility until the hitboxes cease rather than until 2 frames before the hitboxes come out, allowing them to beat out opposing attacks. Chargeable, storable special moves such as Samus' Charge Shot and Donkey Kong's Giant Punch can now be canceled by jumping. These moves can also be executed with the attack button while charging. Most chargeable neutral specials that can't be stored are now reversible, whether for the duration of the charge or right before they are unleashed. Taunts can be interrupted much quicker, with most of them having faster animations. However, this does not apply to damaging taunts such as Luigi's down taunt. The effectiveness of every tether recovery has been nerfed, as they can no longer be performed at any point during air dodges, nor can they skip the lag incurred upon grabbing an edge. Final Smashes are quicker, with versions granting a controllable transformation being removed, so players can return to fighting quickly. As a result, many fighters have either new Final Smashes altogether, or returning Final Smashes with altered functionalities, such as Landmaster being replaced by an Arwing cutscene, and Octopus dragging opponents offstage immediately after transforming. The particle effects of the game are significantly more cartoony, with a solid-color or cel-shaded aesthetic. Compared to Smash 4, hits are signified by spark-like blows instead of colorful stars, while attack effects appear visually longer-lasting or possess far larger particle effects. Continuing a trend from Melee and Brawl, most returning fighters feature greater model detail and more subdued colors than in Smash 4. However, hair and fur detail has been toned down, resulting in a generally flatter appearance. Time slows down substantially and the camera zooms in with a colorful blue background at significant moments during a match, such as when landing a highly damaging special move (such as a fully charged Giant Punch) or when breaking a shield. The camera also does this for potential final hits of a match, dramatically pausing gameplay with intense sound effects and red lightning/background, while zooming in. These are referred to as "Special Zoom" and "Finish Zoom" by Masahiro Sakurai and the development team. Special zoom is signified by a sound similar to landing a KO Uppercut or Finishing Touch, and finish zoom has SFX somewhat akin to the ping sound. The slowdown and zoom do not take place when there are three or more characters on screen, though the blue background will still appear. Knockback dealt by strong attacks will show a bright blue angle indicator, which visualizes the effect of directional influence along the character's final trajectory. This can be difficult to notice due to the effect being very brief. After using up their midair jump(s), characters leave behind a subtle, transparent trail when moving through the air and until they regain their jumps. This aesthetic effect is difficult to notice unless the camera is zoomed onto a character. Punching and kicking SFX on hit are different and sound harder-hitting compared to the previous game, with even weaker attacks playing loud "punch" effects. If two fighter's bladed weapons clash, they now produce a "clanging" noise, reminiscent to a similar effect in Melee. The sound depends on the type of blades that clash; metal blades and energy-based swords both produce different sound effects. Stunned characters now use their voice clip constantly instead of only once, much like in Smash 64 and Melee. This was exclusive to Roy in Smash 4. Fighters sent flying now leave a colorful, lingering trail of solid-colored smoke behind them. If dealt enough knockback, they will also play a whistling sound while flying, akin to a jet plane. Characters flash yellow when they are close to breaking out of a grab, as well as during their grab immunity period after being released. When mashing out of an inactionable state such as being grabbed or stunned, characters display wind blade-like particles around them that increase in quantity depending on how fast they mash. Blast KOs cause a burst of confetti on the screen alongside the standard colorful blast. Star KO'd characters now use a tumbling animation similar to Brawl's Screen KOs, rolling away from the screen as they fly away. Phantom footstools now play the footstool sound effect to indicate one being performed. Final Smashes now cause a segment of the screen to show the upper portion of the summoner's face (in Mr. Game & Watch's case, the close up is of where his eyes would be; in Piranha Plant's case, the close up of its teeth), which is taken entirely from the summoner's official artwork, before the move begins, similar to Chrom's appearance in Pair Up. Compared to Brawl and Smash 4, several fighter animations have been made significantly more dramatic and tailored to look better from the camera's perspective. Examples of this are Mario's Up Tilt, Bowser's Flying Slam, and Donkey Kong's Giant Punch. Fighters are much more expressive than they were in Smash 4; most characters now sport a shocked/surprised expression when missing a grab and will scowl or frown when putting up their shield. Any characters standing too close to a Final Smash will visibly react to it by displaying a shocked facial expression. While on Final Smash standby, the character's damage gauge will constantly spark with aqua-colored electricity. Upon use, one of the eyes on the fighter's character portrait will flash. When a character has more than 120% damage, smoke will constantly come out of their damage meter. Many Assist Trophies and Final Smashes now affect the background of the stage. On the results screen, the announcer now says "(Character name/Team color) wins!" ("(Character name/Team color) win!" in the Japanese version), instead of saying "The winner is... (character name/team color)!" (Brawl/Smash 4) or "This game's winner is... (character name/team color)!" (Smash 64/Melee). Additionally, after Team Battles, all teammates will perform their complete victory animation instead of only the player with the highest score/stock count, much like the first three installments. In Smash 64, the announcer did say "(Team color) wins! ", but this was changed in Melee. Even more characters now face the screen regardless of direction they turn towards, such as Donkey Kong and the Ice Climbers. In addition, some Assist Trophies and Poké Ball Pokémon face the screen regardless of the direction they turn towards. Names now override some instances of character names, such as underneath the damage meter. If the player enters a name, any Poké Ball Pokémon or Assist Trophy character summoned by the player will be indicated by the player's name. In some cases, this may be harder to notice in stages with brighter lighting due to the name bar lacking the bordered background. Reflection moves now display shining hexagon effects, similar to Fox's and Falco's Reflector, upon reflecting projectiles. Counterattacks that retaliate against sufficiently strong attacks will now cause the user to let out a large, bright yellow flash. The flower effect's flower appearance was changed and now resembles the pink flowers seen on the title screen of Panel de Pon. Certain types of items, such as Banana Peels, can now be picked up by tilt attacks. There can now be more than one Assist Trophy active at any given time. Additionally, some characters summoned by an Assist Trophy can be KO'd, granting a point to whoever KO'd said character. The summoner can also KO their own assist trophy to prevent the loss of a point. If multiple players summon an Assist Trophy each, they will proceed to fight one another if close enough. Fake Smash Balls were introduced, with inverted lines as their design. When broken, these explode into a colorful X-shaped explosion, causing heavy knockback and damage to nearby fighters. Unlike the standard Smash Ball, Fake Smash Balls tend to drift towards players and take less hits to break. Smash Balls and Fake Smash Balls have a chance of spawning with Soccer Ball physics, rolling around the stage and respawning once they drop offstage. These despawn after a set time. The Boss Galaga causes a black background to cover the screen when it catches an opponent, complete with pixel stars. Additionally, if the Boss Galaga Star KOs a character, it can now be seen with the character in the distance. The star also becomes larger. The Hammer and Golden Hammer have a unique 8-bit-styled hit particle, resembling the particle effect used when Mario destroys a barrel in the original Donkey Kong. The corresponding sound effect is also taken from the original game. The Warp Star's descent can now be stalled by the user. The Timer now creates a dark warping background alongside its usual slowdown effect. Blast Boxes now explode after some time if hit. This is signified by a dull orange flash around the box that slowly gets brighter. Trophies have been dropped in favor of Spirits, which function and visually appear to be similar to Brawl's Stickers. The Beam Sword now creates an aesthetic trail from its blade when thrown or dropped. Sandbag will now show a happy expression if left idle for long enough. Shrinking and growing animations have been reverted to their Melee versions. As such, they are much faster and are no longer unique to each character. Explosive items directly thrown at opponents no longer harm the thrower. Official illustration of Mario and Rathalos. Official illustration of Simon and Richter. Official illustration of Villager and Isabelle. Official image of Pac-Man and Mr. Game & Watch. Official illustration of Link, Kirby, Mario, and Cloud. Official illustration of Sonic the Hedgehog. Official image of all playable Pokémon characters, and the many Poké Ball Pokémon. Official illustration of the playable Zelda cast. Official illustration of all playable Fire Emblem characters and Assist Trophies. Official image of all playable Fire Emblem characters on Arena Ferox. Official illustration of Bayonetta, Rodin, and Madama Butterfly. Official illustration of all of the base game fighters. Splash art of Dark Samus. Splash art of King K. Rool. Splash art of Piranha Plant. This is the first Super Smash Bros. game since the original Super Smash Bros. to not be announced alongside new hardware. Super Smash Bros. Melee was revealed alongside the final retail version of the Nintendo GameCube at E3 2001; Super Smash Bros. Brawl was announced alongside the Wii itself, then-codenamed Revolution at E3 2005; and Super Smash Bros. 4 was announced alongside the Wii U at E3 2011. Moreover, unlike the latter two games, this is the first time since Super Smash Bros. Melee that a Smash Bros. game is not announced years in advance, as Super Smash Bros. Brawl was announced in 2005 and revealed a year later, and Super Smash Bros. 4 was announced in 2011 and revealed two years later, with both released in 2008 and 2014 respectively. This is the second game to feature attack names for several standard attacks and aerial attacks, as well as the first to show them in-game (in character-specific tips). Previously, only Melee had listed attack names in a Nintendo Power Player's Guide. Not feature the involvement of Satoru Iwata, as he passed away in July of 2015. Be released in the same year it was announced since Melee. Have no veteran characters cut since Melee. Have a simultaneous worldwide release. Have the announcer, Master Hand, and Crazy Hand's English-language voice actor unchanged, with Xander Mobus reprising his role from Super Smash Bros. 4. Allow Master Hand to be legitimately playable, via a brief gameplay sequence near the end of World of Light. In previous games, Master Hand was only playable via glitches and/or external modification of the game's code (e.g. cheat code devices such as Action Replay). Retain the blast line KO sound effect from the previous game. Feature unlockable characters and only one newcomer on the box art. Have all of its veterans announced prior to launch and at the same time. Have none of its newcomers as starter characters. Feature more unlockable characters than starter characters. Feature third-party universes with more than one character. Feature clones from third-party universes. Have more returning stages than new stages. Have no new version of the credits music from the original Super Smash Bros.
Not introduce a new item from The Legend of Zelda series. Feature a third-party universe with more than one stage in the same game. Feature third-party universes with more than one Assist Trophy. Have an Assist Trophy character originating from an indie game. Not introduce a new type for a playable Pokémon (as both Fire and Dark were used in previous games). Have a theme song in both English and Japanese. Have a generic enemy (Piranha Plant) be playable. Have the characters and stages ordered on their respective select screens by the order they were added into the series (with the exception of Mii Fighters and Echo Fighters) instead of being placed next to the characters from the same universe. Depict all of the Original 8 fighters on the front cover of the boxart in their entirety. Feature fewer total newcomers (including DLC) than its predecessor. Have no veteran characters as DLC. Have all characters share the same amount of alternate costumes. Have Kirby's victory poses finish in a different way. Introduce more playable third-party universes than first-party universes, being two and one respectively. Add extra game modes in updates, namely Stage Builder. Have the announcer voice a playable character, Joker (not counting the Name Entry Glitch). Not introduce a character that has a move that can absorb. Because of the size of the USK icon on the game's box art, the German version has a slightly different variation of said box art: Pikachu is moved upwards, Yoshi is completely missing, and the logo is off-centered. The Ultimate logo features the same curved line under the game title as Super Smash Bros. 4, though it is no longer hidden behind the series name. Ultimate's release date falls one day after the late Satoru Iwata's birthday, December 6 (which was also the release date of Super Smash Bros. for Wii U in Japan). Ultimate is currently the only Super Smash Bros. game to not feature collectible trophies since their introduction in Melee. This is the third Super Smash Bros. game to feature hand-drawn artwork on the box art, with the first being the original Super Smash Bros. and the second being Super Smash Bros. Brawl. This is the second Super Smash Bros. game that has been rated E10+ by the ESRB, following Super Smash Bros. 4. This is the third Super Smash Bros. game that has been rated 12 by PEGI, following Super Smash Bros. Brawl and Super Smash Bros. 4. Newcomers at 11, beating Smash 64's original 12. New stages at 7, beating Smash 64's 9. Counting DLC, though, Ultimate would be ahead of it, as five downloadable stages are currently planned. New character-based universes introduced, with only two (Splatoon and Castlevania), beating Melee's three (Ice Climber, Fire Emblem, and Game & Watch). Counting DLC, though, they are both currently tied (with Persona being added as DLC in Ultimate). As well as Pit's, Palutena's, Greninja’s, Incineroar‘s, Pichu's, and R.O.B. 's first appearance on the Nintendo Switch. ↑ "Famitsu News — “Sakurai Catching a Breather”" - Source Gaming. ↑ 4.0 4.1 4.2 "“Smash is Special” COMPLETE Translation" - Source Gaming. ↑ "Why Super Smash Bros. Ultimate was such a daunting game for its creators to build" - The Verge. ↑ “Nintendo Apply for a Number of Trademarks” - Japanese Nintendo. ↑ Sakurai announces that he has been working on Smash for Switch. ↑ Translation of Sakurai's Smash for Switch tweet. ↑ "“Compliance and Labor” – Sakurai’s Famitsu Column, Vol. 542" - Source Gaming. ↑ Several trademarks from Nintendo are approved for use. ↑ Bear witnessing Sakurai shaking his head. This page was last edited on April 24, 2019, at 00:58.